The Jungfruplatsens Pizzeria & Kebab is actually not located within the Gothenburg municipality but in the neighbour municipality called Mölndal which is a 20 to 30 minute tram ride from the center of Gothenburg or 15 minute car ride. We think the food at the Jungfruplatsens Pizzeria & Kebab is so good though that we have decided to list it here on the Gothenburg Guide even if its not located within the Gothenburg municipality. The service at the Jungfruplatsens Pizzeria & Kebab isn’t the best but the good food makes up for it. The Jungfruplatsens Pizzeria & kebab is situated in the corner of a tiny square called Jungfruplatsen. In the summertime they have a nice outdoor sitting area. The interior is a lot better then most other Pizzerias in Sweden. Their menu consists of a large selection of Pizzas, some salads and a couple of doner kebab dishes. A pizza at Jungfruplatsens Pizzeria & Kebab ranges between 65 SEK – 95 SEK however we recommend you try a kebabtallrik which the Jungfruplatsens Pizzeria & Kebab is quite famous for doing really well. 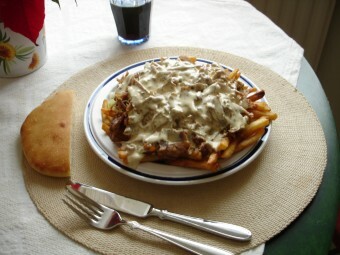 A kebabtallrik is a plate that consists of french fries covered in doner kebab meat and a type of yoghurt sauce. A kebabtallrik at Jungfruplatsens Pizzeria is currently priced at 80 SEK. A takeaway kebabtallrik from Jungfruplatsens Pizzeria & Kebab.